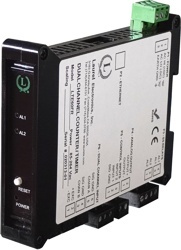 The Laureate process signal input transmitter and totalizer accepts 0-1 mA, 4-20 mA or 0-10V signals from flow meters and other transducers, such as watt meters, to track rate or totalized rate. With Standard Main Board: Rate, square root of rate, or totalized rate from differential pressure flow transducers with a DC output. In the write-in field of your order for VF4, specify min input, min reading; max input, max reading. Component changes by the factory may be required.